You can use a simple formula to sum numbers in a range (a group of cells), but the SUM function is easier to use when you’re working with more than a few numbers. For example =SUM(A2:A6) is less likely to have typing errors than =A2+A3+A4+A5+A6. Here’s a formula that uses two cell ranges: =SUM(A2:A4,C2:C3) sums the numbers in ranges A2:A4 and C2:C3. You’d press Enter to get the total of 39787. Type =SUM in a cell, followed by an opening parenthesis (. To enter the first formula range, which is called an argument (a piece of data the formula needs to run), type A2:A4 (or select cell A2 and drag through cell A6). Type a comma (,) to separate the first argument from the next. Type the second argument, C2:C3 (or drag to select the cells). Type a closing parenthesis ), and then press Enter. Each argument can be a range, a number, or single cell references, all separated by commas. Tip: If you need to sum columns or rows of numbers next to each other, use AutoSum to sum numbers. If you want to play around with our sample data, here’s some data to use. 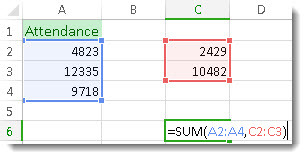 You can see how the SUM function works by copying the following table into a worksheet and pasting it into cell A1. Adds 5, 15 and 1. The text value "5" is first translated into a number, and the logical value TRUE is first translated into the number 1. Adds the values in cells A2 through A4. Adds the values in cells A2 through A4, and then adds 15 to that result. Adds the values in cells A5 and A6, and then adds 2 to that result. Because non-numeric values in references are not translated — the value in cell A5 ('5) and the value in cell A6 (TRUE) are both treated as text — the values in those cells are ignored.